Legitimate websites may require that their visitors install software. These sites often do so to provide their users with additional functionality beyond what's available in standard web browsers, like viewing a special type of document. Please note, however, that if your site requires specific software for your visitors, the implementation of this software installation process is very important. Incorrect implementation can appear as though you're installing malware, triggering our malware detection filters, and resulting in your site being labeled with a 'This site may harm your computer' malware warning in our search results. Bad: Install the required software without giving the visitor a chance to choose whether or not they want to install the software. Good: Redirect the new visitor to an information page which provides thorough details on why a special software installation is required to use the site. From this page the visitor can initiate the installation of the required software if they decide to proceed with installation. Has your site been labeled with a malware warning in our search results due to a poorly implemented software installation requirement? Updating the installation process to ensure that visitors are fully informed on why the installation is necessary, and giving them a chance to opt out, should resolve this issue. Once you've got this in place, you can go to Webmaster Tools and request a malware review to expedite the process of removing any malware warnings associated with your site in Google's search results. If you allow users to publish content on your website, from leaving comments to creating user profiles, you’ll likely see spammers attempt to take advantage of these mechanisms to generate traffic to their own sites. Having this spammy content on your site isn't fun for anyone. Users may be subjected to annoying advertisements directing them to low-quality or dangerous sites containing scams or malware. And you as a webmaster may be hosting content that violates a search engine's quality guidelines, which can harm your site's standing in search results. There are ways to handle this abuse, such as moderating comments and reviewing new user accounts, but there is often so much spam created that it can become impossible to keep up with. Spam can easily get to this unmanageable level because most spam isn’t created manually by a human spammer. Instead, spammers use computer programs called “bots” to automatically fill out web forms to create spam, and these bots can generate spam much faster than a human can review it. You can easily take advantage of this technology on your own site by using reCAPTCHA, a free service owned by Google. One unique aspect of reCAPTCHA is that data collected from the service is used to improve the process of scanning text, such as from books or newspapers. By using reCAPTCHA, you're not only protecting your site from spammers; you're helping to digitize the world's books. If you’d like to implement reCAPTCHA for free on your own site, you can sign up here. Plugins are available for easy installation on popular applications and programming environments such as WordPress and PHP. If you like to learn by reading, download our SEO Starter Guide for reading while you're on an exercise bike, training for Ironman. Or, if you're more a video watcher, try listening to my "Search Friendly Development" session while you're cleaning your house. Keep in mind that some parts of the presentation are a little more technical. For good measure, and because at some point you'll hear references to them, check out our webmaster guidelines for yourself. Are you done with the basics but now you have some questions? Good for you! 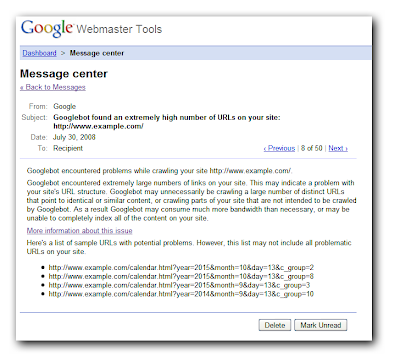 Try researching a particular topic in our Webmaster Help Center. For example, do you want more information about crawling and indexing or understanding what links are all about? Asking for feedback from the webmaster community -- we've got a super skilled group of Google employees, members, and Bionic Posters. The quiz will be available to take from today until Wednesday, January 27 at 5PM PST. It doesn't cover all facets of webmaster problems that arise, and—as with any test—it is at best only a fun way to test your webmaster prowess ;). We leave discussion of specific cases to the forum. We've set up the quiz using our very own Google Docs. This means you won't see results right away, but we plan to write a follow-up blog post explaining answers and listing top scorers. Be sure to save your answers or print out your completed quiz before submitting! This way you can check your answers against the correct ones when we publish them. We have a lot of videos ready to share, so we're not currently taking new questions for the Grab Bag. If you have a question that you would like answered, your best bet as always is to head to our Webmaster Help Forum, where you'll find plenty of knowledgeable webmasters, including some Bionic Posters! To be kept up-to-date on our latest video releases, you can follow @googlewmc on Twitter, where we'll announce new videos and blog posts as they're published.